Beach picture, Will Rogers State Beach, 1952. Caption slip reads: "Photographer: Sandusky. Date: 1952-05-03. Assignment: Beach pix, Will Rogers State Beach. 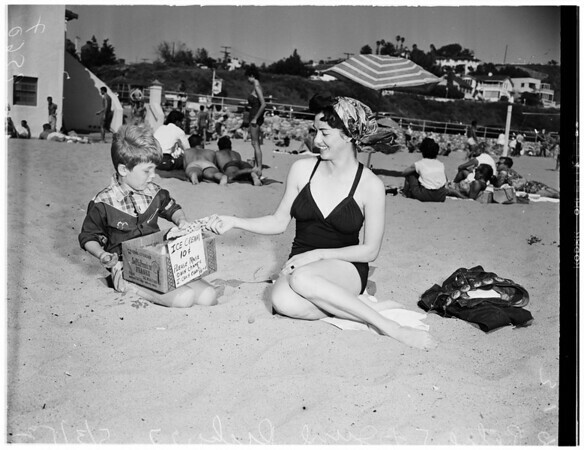 D9-12: 'Petie', 5-yr-old ice-cream salesman makes a sale to June Drake, 27, while nibbling at the profits himself. Note sign which reads 'Ice cream 10 cents. Please make your own change as I can't count -- Petie".